Former Castleford Academy student Callum McLelland has signed a three-and-a-half year contract with Leeds Rhinos. The 18-year-old came through Castleford Tigers’ Academy and was a key member of their under 19s team that reached their Grand Final last year, but left the club to switch codes to play rugby union for Edinburgh Rugby in November last year. He is now back in rugby league with the Rhinos having agreed an undisclosed fee with Scottish Rugby to bring the Pontefract-born youngster back home to the 13-man game. McLelland had qualified for Scotland through a grandfather born in East Ayrshire and gained eight caps for Scotland U20s. Previously he represented England Rugby League at U16 and U18 levels before switching codes last year. Commenting on the signing, Rhinos director of rugby Kevin Sinfield said, “We are delighted to have signed Callum. He was a huge loss to our sport when he left and it is great to welcome back. He is an outstanding talent and, in his age group, he is up there with the very best. “There were a host of clubs who were chasing his signature and it is brilliant news for Leeds Rhinos that he has agreed to join us. “It was important that we created some competition in our half backs. Callum has a great football brain and he will complement what we have for next year in Richie Myler and Tui Lolohea, that internal competition is something I have been keen to improve since I returned; they will drive each other on and the two that get the shirts will do their best for us on any given week. I am expecting big things from him throughout his time at the Rhinos and he has the talent to be here for a long time,” added Sinfield. McLelland played rugby union up to the age of 13 before focusing on league, representing the Lock Lane ARLFC club and attending Castleford Academy School. He captained England U16s last year, helping them to two-match series win against France in October, scoring a match winning drop-goal in a 19-18 victory in the opening game. He will be part of the Rhinos first team squad for 2019 but is also still eligible for the Under 19s squad next season. McLelland said, “It is great to be joining a club like Leeds Rhinos and I am very excited about my future here. “I have enjoyed my opportunity in rugby union and would like to thank Richard Cockerill, all the coaches and players at Edinburgh and with Scotland U20s who worked with me over the past year. 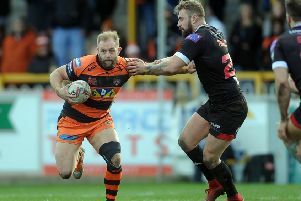 McLelland is not eligible for the Rhinos first team this season with the transfer deadline for the remainder of the season having now passed however he has already started training with his new teammates.